New to My Shelves: After today's soccer game, we stopped by Barnes and Noble because that gift card I got last weekend was burning a hole in my pocket. I came away with a few books that have been sitting on my wish list awhile. Mouse picked out a book for herself as well. 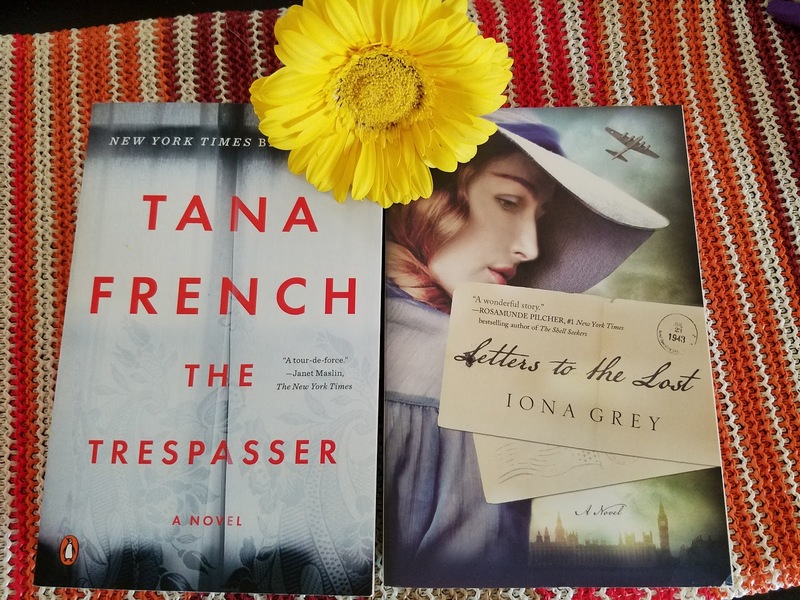 What I Am Reading: I am afraid Brad Watson's Miss Jane got set to the side for no other reason than I found myself in need of a book to read, and the only book handy was my September TBR List winner (thanks again to all who voted! ), Owl and the Japanese Circus by Kristi Charish, which kind of took over all my attention. Well, that and Quiet, which I am continuing to read as part of the read-along hosted by Book Bloggers International blog. I suspect I will be finishing at least one this weekend, if not both. What I Am Listening To: I still haven't started a new audiobook. I have been listening to music when in the car as of late--that and my daughter singing to me. What I Am Watching: I finally got to season 11 of Supernatural. I haven't really watched much else than that. I'm not even sure what new shows are coming out. I feel so out of the loop. What My Week Was Like: This was our first week of our new fall routine, with Girl Scouts, dance, soccer, school, and work. Homework also started up this week. And Mouse and her dad are taking part in the 100 Mile Club, a before school activity in which they either walk or run laps a couple days a week, eventually working their way up to 100 miles. I would join in, but I am already at work at that time of morning. I figure it is a good father/daughter activity. Mouse's team won their soccer game today--a big turn around from last weekend's game. Mouse isn't particularly competitive--she's more into the sport for the social aspect and being part of the team rather than actually playing, and it shows. She seems to be having fun though, and, for me, that's what matters most. What I Am Worried About: Parker, my senior cat. He isn't doing too well, barely eating and losing weight again. He has chronic health issues and is on a number of medications as a result. We go through phases like this, and each time I worry we'll lose him, especially the older he gets. 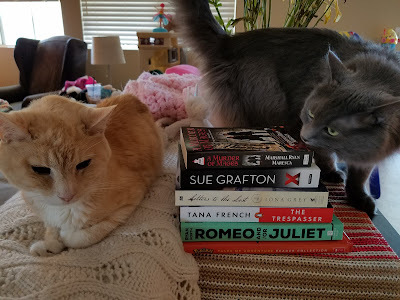 My furkids checking out my new books. I hope Parker feels better soon! I hate it when animals start skipping their meals and not eating. It sounds like you're pretty busy with activities. 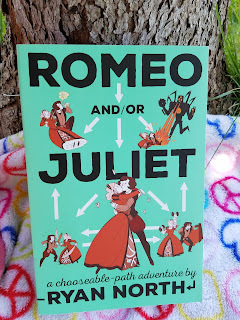 I would also fight for Romeo and/or Juliet: A Chooseable-Path Adventure by Ryan North- it sounds like a fun read. I'm glad Mouse is having fun with soccer- I was a non-competitive kid too. I only joined soccer because my friends liked it and it was something to do after school. I have to go to the dentist and keep an eye on the weather to protect my garden this week. It's been cooler and I'm not quite ready to give up gardening for the season. I hope you have an awesome week! I'm loving that they are coming out with choose your own adventure type books for adults. I used to love them as a kid. I can't wait to read North's book. I hope you have a good visit at the dentist and are able to protect your garden from the coming cold weather. Thanks for stopping by! I hope Parker gets better soon! Poor baby. I've been wanting to start the Grafton books. They look so good and I've heard great things about them. Oh, I love that picture of the fur kids and your books. 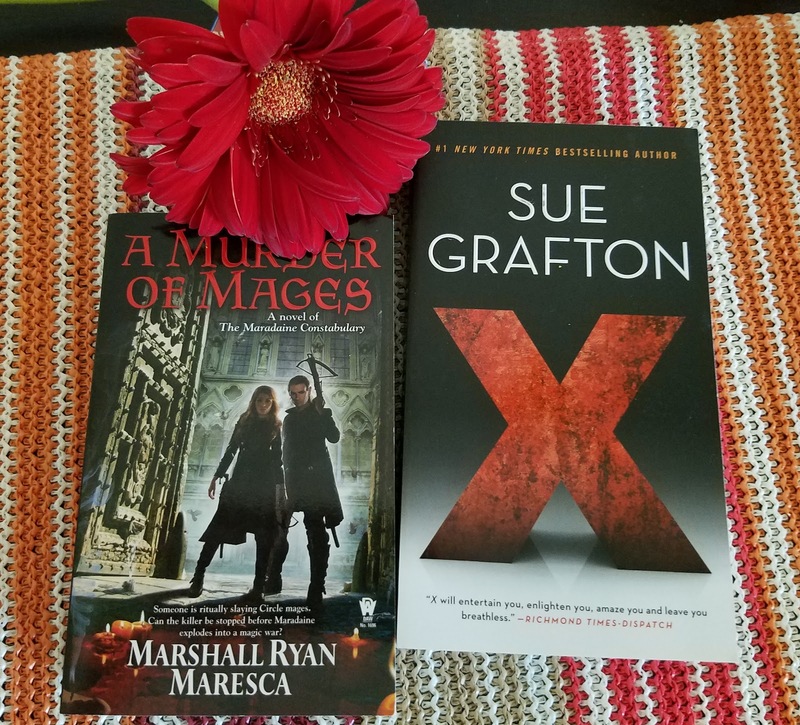 I adore Sue Grafton's book, and the last one I read was X. I have Y just waiting, while I try to catch up on ARCs and other books that seem to demand my attention. I'm glad school is going well for Mouse...and I like that 100 mile club idea. I hope Parker's health improves....sigh. Enjoy your week, and thanks for visiting my blog. I'm loving the cooler days. Laurel-Rain - I couldn't resist sharing that one. :-) I am glad you enjoyed X! I am looking forward to reading it. I still have to get through U,V & W actually, so I'm still a bit behind. Thank you for the well wishes for Parker. Hopefully he will start feeling better soon. I hope you have a great week too! Thanks for visiting, Laurel-Rain! It's so much fun to shop with a gift card but I always spending a lot of extra money. I'm so sorry to hear about Parker. I know that's tough on all of you. Kathy - Yes, it is! I only went over by $20, so it wasn't too bad this time around. :-) Thank you for your kind thoughts about Parker. I want him to live forever, but I know that isn't possible. Hope you enjoy the books and I want "Romeo and/or Juliet: A Chooseable-Path Adventure" by Ryan North. It sounds like a fun read! Melody - Thank you, Melody. I hope so too. He's been a real trooper. I have a feeling my husband will get to North's book first, but I do look forward to reading it as well. :-) Thanks for stopping by! I know what you mean about those B&N gift cards. I can't hang onto one for very long ha ha. And I need to read Tana French at some point. Sending positive vibes and best wishes your way for Parker, I hope it's nothing serious. Love the cat pic!! Greg - I have only read one book by Tana French (In the Woods), which I loved. I have been collecting her other books to read. I really need to get to them! Hopefully you will enjoy her books when you give them a try. Thank you for your well wishes for Parker. I keep telling myself he must not be terribly bad off if he's not gone into hiding yet, but the weight loss really has me worried. I think the stress of us boarding him while we were out of town was just too much for him. :-( I had arranged for someone to house sit for us while we were gone last month, but the person cancelled at the last minute and so we had to board him at the vet's. I felt terrible about that. And now this . . .
Love how you structure this post. I hope you enjoy your books and have a wonderful week. Sorry to hear about Parker's health condition. It know it must be hard on you all. Geybie - Thank you on all counts! Parker's such a trooper and has been through so much. We all love him very much. I hope you have a great week too! Thanks for visiting. As I live in Belgium were English book shops exist but are rather rare, Barnes & Nobles sounds like Wonderland to me! I wouldn't be able to resist a gift card as well! I hope you'll enjoy all the books you got! Happy reading! Lynn - Barnes and Noble is a real treat to visit. I used to live closer the store and would visit every other week just about. My daughter was sad we didn't stop in at the little cafe they have while we were there, but my husband was anxious to get home. Thanks for visiting! Megan - Romeo and/or Juliet does sound like fun, doesn't it? I used to love reading Choose Your Own Adventures as a child and so these adult versions bring back such fond memories. :-) Thank you for your kind thoughts for Parker. I hope so too! Thanks for stopping by, Megan! I hope that Parker gets well/feels better soon! I hope you have a great week as well! Thanks for stopping by. I hope everything is okay with Parker! I worry so much about my pets as well. Have a good week! Samantha - Thank you. I hope so too. We love him dearly and it's so hard to see him suffering. I feel so helpless. I hope you have a great week too! Thanks for visiting. I need to read the Kristi Charish books! And Romeo and/or Juliet, really. 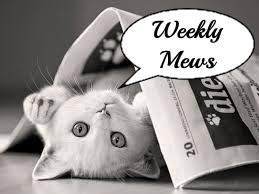 Hope you have a good week, and your cat gets better! Nikki - I am really enjoying the first book in Charish's series, although it does feel a bit long. I hope you have a good week too! Thanks for the well wishes for Parker. Thanks for stopping by! Oh my gosh, Letters to the Lost by Iona Grey, girllllll I loved that book. 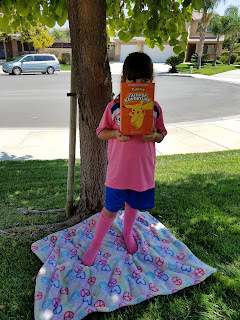 Mouse is too cute with her Pokemon book. I hope Parker feels better, he sounds like a trooper. Naida - I wish I could remember where I first heard about Letters to the Lost. Maybe it was from you then? It does sound really good. I'm glad to hear you loved it! Thank you for the good thoughts for Parker. He really is a strong little guy. He's been through so much. I need to do some housework too. Did you have to remind me? Haha. Have a great day and thanks for stopping by! Poor Parker! I hope he feels better soon. It's tough with older pets. You just want them to get better, but you know that someday, they won't. I hope that day is very far from now. Nice book haul, and I look forward to your review of Owl and the Circus. I have it on my Kindle, but haven't gotten around to it yet. Lark - Thank you so much for your kind thoughts for Parker. I hope his time isn't coming soon, but I know it's inevitable. He's such a sweetheart. I hope Parker feels better soon!! I lost my senior cat about a year ago and it broke my heart. I adore the cover to Romeo and/or Juliet! I definitely need to check that out. Got to love gift cards. Happy reading! Natalie - Thank you. I hope so too. I'm so sorry about the loss of your cat. It really is heartbreaking when we lose our animal companions. Not everyone understands the grief that comes with it, but it can really run deep. I love gift cards too! Thanks for visiting, Natalie! Looks like a great haul. I'm particularly intrigued by Romeo and/or Juliet. Katie - I'm excited about reading all the books. :-) Thank you for your kind thoughts for Parker! I'm glad the girls won their game. They needed that for their confidence, I think. Sarah - Hopefully it will be good. It looks like fun. :-) Thank you for your kind thoughts about Parker. I hope you are right! Thanks for visiting! And poor cat... I hope he will be better soon! Evelina - I really like the sound of Romeo and/or Juliet too! I have a Jane Austen one I still need to read as well, which sounds like it will be fun as well. Thank you for your kind thoughts for Parker. How old is Parker, Wendy? I'm sorry to hear he's sick again. We have 2 senior cats now 14 and 15 and both have lost weight these last few years. one 5lbs and the other almost 3. They are still fairly active but just don't eat that much (except constant treats) and we waste more $$ on canned foods, always trying new stuff to get them to eat. One isn't supposed to eat hard food but, it's all he wants. Mouse is sure busy with her activities, she is growing so fast. Have a great week. Fall makes me think of --Apples -- pies, coffee cakes, applesauce, cobbler all sound good to me LOL . We had some perfect fall weather but now, it's been humid and low 80s for a few days UGH and AC is on. Enjoy your week. Diane - Parker is about 16 years old now. I've been feeding him treats right and left (which, of course, I can't keep my younger cat away from either--although she's good about sharing). I'm about ready to break down and buy some of that popular expensive not so good for you cat food for Parker to see if that encourages him to eat. The vet wants him on a wet food only diet to make sure he's getting in enough water, but the cats much prefer the dry food (you know how that is!). well, Parker did, when he was eating, that is. Even the treats are hit and miss with him right now. He's starting to have accidents outside the litterbox which is worrying me too. Poor guy. I feel so helpless. Anyway, I know you understand, and just how hard this has been. I look at Mouse and can't believe how big she is now. There's no more of that baby and toddler she used to be. She's all school-aged girl now. I am glad Mouse is interested in doing so many things, but sometimes it feels like too much. Maybe that's just my old age talking. LOL I'm not young like she is. She enjoys it all though, and, for me, that's what matters. I hope you have a great week too! Apple pie sounds good right now. :-) Fall weather here is low 80's and high 70's, so it's perfect to me. Of course, we aren't getting the humidity you are, so that makes a difference. I hope your weather cools down some for you soon! Thanks for visiting, Diane! Donna Marie - Thank you so much for your kind thoughts. He is still getting around some, although slowly, so that's a good sign. I've taken to bringing his food upstairs to see if that helps motivate him to eat more. I'm so glad the cancer has stayed away. The type of cancer it is is pretty aggressive in terms of coming back we were told, and so it's something we have been watching for. Yay Mouse and her soccer team! I do hope Parker your car gets to feeling better. Enjoy the new books. Jeanea - It was a good game. Pretty intense too, considering they are all 6 and 7 year olds! Then you have my daughter who is so laid back and not always paying attention to the game. LOL There always has to be that kid on a team, doesn't there? Thank you for the well wishes for Parker. I am praying for Parker. It is so hard to watch them decline. My Phoebe is doing the same right now because of kidney disease. That is a nice activity for your daughter and hubby to do before school. Ellen - Thank you for your prayers. I am sorry though to hear about Phoebe. I will keep her in my prayers as well. Oh man. I'm sorry to hear about your older kitty. Hopefully it is something minor and he is good as new in no time! You got lots of neat books. I've not heard of any of them, but the Grafton one has me curious. Alyssa - Thank you. It would be nice if it was something minor. I sure hope it passes, whatever it is. I really enjoy Grafton's books. They are set in the 1980's, which gives them a bit of extra charm, I think. I hope you enjoy your week too! Thanks for stopping by! First off, hope Parker feels better! It must be so difficult to see a dear pet sick. Sending good vibes for him. And, you definitely sound like you have your hands full with all the activities for Mouse and well, life in general. I am still in catch up mode after vacation and now that I have to look for a new job I'm swamped with that. My reading doesn't feel like it's going anywhere but I just need to make some lists and start crossing off things accomplished! Hope you have a great week Wendy! Iliana - Thank you. I hope so too! He's been getting lots of love from all of us. Life does seem pretty busy for us these days. In some ways I like it and others, I miss the quieter times. I wish you luck with your job search. I know it's not easy. I hope you have a great week too. Hang in there as best you can! Great haul! And your kitties are gorgeous. Happy reading! I haven't heard of any of these books before. Thanks for sharing them. I hope you enjoy your new lovelies! Hooray for Mouse & her team! I hope Parker is okay. It's o worrisome when pets get like that, especially since they can't just verbally tell us what's wrong. Well, hope you have a good week despite that. Christy - Thank you! It was quite a turn around from the first game of the season. I hope Parker will be okay too. He's been with me through so much. Thank you for visiting! I loved Letters to the Lost. Hope you enjoy it and your other books. I hope Parker will be all right! Thanks for sharing the books and happy reading! Olivia - Thank you! I hope so too. Thanks for stopping by. The Tornado got that same Pokemon book last time we were at Barnes & Noble! He's been carrying it around ever since. All of your books look fantastic. I used to love the Sue Grafton mysteries but I'm so far behind now I almost feel like I need to start over which of course means I haven't read any in years! 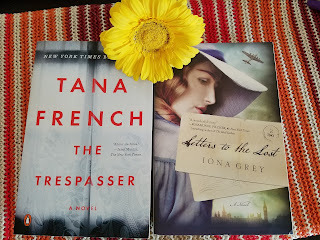 I finally have read my first Tana French and I really liked it. I'm looking forward to continuing the series. I'm so sorry to hear about Parker. Hopefully it's nothing serious and he'll feel better soon but I understand the worry. Have a great week! Katherine - That's too funny about them choosing the same book. :-) Mouse is quite attached to her copy too. I need to get caught up with Grafton's books too. And with Tana French's. I still have only read the one, but I seem to be collecting all her books. Thank you for the kind thoughts for Parker. Thanks to the new medication he got today and the fluids, he is eating a little again, which is a relief. Hopefully it will last. Thank you for visiting, Katherine! Looks like you've got some great reads ahead. I'm especially curious about Romeo And Or Juliet. Your fur kids look like they might be conspiring to keep you from reading too much, lol. Hope you have a wonderful week! Suzanne - Thank you! I am looking forward to reading Romeo and/or Juliet too. It does look like fun. :-) Yes, my cats do tend to do their best to distract me from my reading sometimes. LOL Gotta love 'em. Thanks for visiting! First, I like how your book blog is all cat-themed. Not familiar with any books in your haul but I hope you enjoy reading them. Aww, for Parker the cat. Senior cats are hard to predict. One moment they are playing and doing fine, the next they are lethargic and won't budge. Hope Parker feels better soon. Thank you for your kind words for Parker. He's doing a little better now that he's started on a new medication and gotten some fluids in him. Unfortunately, we won't know how series it is until after the tests come back and maybe not even until after the ultrasound. I hope it's not serious, but I know, at his age, problems are inevitable. Thanks for stopping by! I hope your kitty is doing better. We have a senior cat that has a few health problems too. It sounds like you guys have a pretty busy schedule. I hope you enjoy all of your new books! Carole - Thank you! He's hanging in there. He's eating now with the new medication, and hopefully it will last. I hope your cat is doing well. It's hard when they get older, isn't it? We love them to pieces and it's so hard seeing them suffer. Thanks for visiting!